WITH Christmas and New Years now done and dusted, Round 8 of the Southern Cricket Association got under way in very hot humid conditions with temperatures in the mid 30s at the weekend. Despite the hot weather there were some great individual and team performances. In Seventh Grade Stuart Muir wasted no time in getting amongst the wickets when he sent down seven overs to take the amazing figures of 7-16 in New Norfolk III's convincing eight-wicket win over Claremont at Tynwald Park. Muir's seven-wicket haul skittled the Claremont batting line up, bundling the visitors out for just 29 runs off 13.1 overs. Other wicket takers were Graeme Rowlands with great figures 2-4 off 2.1 overs and Jye Bearman with 1-8 (4). In reply New Norfolk lost just two wickets in the run chase, finishing 2/31 off 8.3 overs. Aaron Triffitt top-scored with 13no including one four. In Fourth Grade, Bushy Park all-rounder Mitchell Crosswell belted a fine 112 in his side's big 177-run win over Bothwell I at the Bushy Park Showgrounds. Crosswell's century was the mainstay of Bushy Park's big total of 8/304 off its 50 overs. The all-rounder came in with the score on 3/69 and was dismissed with the score at 7/269. Captain Shaun Fenton also got amongst the runs with a well put together 53. Ben Triffett made 22 and Nicholas Fenton was 18no. There were 46 extras. Best of the Bothwell bowlers were captain Cody Eyles 2-32 (6), Matthew Eyles 2-39 (7) and Brodie White 2-40 (7). In reply Bothwell was dismissed for 10/123 off 33 overs. Bradley Eyles was the only batsman to reach double figures, making 41no. There were 45 extras. Dylan Grant was the pick of the Park bowlers, capturing 4-24 off six overs in a great display of bowling. Brother Trent Grant also did well finishing with 3-28 off 10. Capping of a good day, Mitch Crosswell took 1-16 (4) and Shaun Fenton 1-9 (3) while Troy Smith got 1-24 (7). In the other Fourth Grade matches, New Norfolk II played out a excellent 28-run win over Hobart at Risdon Vale on Saturday. After being dismissed for just 101 off 39.5 overs, New Norfolk went about dismantling the Hobart line up for just 73 off 29 overs. Todd Rusher 4-20 off 8 overs and Cody Morgan-Coleman 4-20 (9) swung the ball in all directions with the opposite struggling to get bat on ball. The pair put on a superb bowling performance. Josh Walsh 1-14 (5) and Aaron Drew 1-18 (6) also bowled tightly. Traveling to Bagdad, Gretna II went down to the visitors by four wickets. After being sent in, Gretna made the very good score of 10/245 off 45.5 overs. Luke Crosswell showed he has plenty to offer with a well-made 39 (three fours). Peter Jelkic made 36 (five fours, one six) and Tom Allcock also made 36 (four fours, one six). Opener Jordan Hastie 35 (six fours) and at number 11 Damien Hack remained 21no (three fours). In reply Bagdad chased down the total finishing 6/248 off just 36.1 overs. Openers Adam Browning 3/30 (7.1) and Peter Jelkic 2-65 (8) were the main wicket-takers for Gretna. Playing at home, New Norfolk I went down to St Anne's by four wickets. The Red Caps were sent into bat and were dismissed for 168 off 48.3 overs. Harry Booth top-scored with 38, Rohan Heron supported well with 34 while Nathan Eiszele made a good 25 and Jason Rigby 21. In reply St Anne's chased down the total, finishing 6/169 off 34.3 overs. With the ball Seb Wishart had the best figures of 2-12 off 6 overs while Josh Dykes took 1-21 (8). Molesworth I won its fourth match in a row, defeating Montagu Bay by in a close one by two wickets at Boyer Oval. The visitors won the toss and had first hit, making 10/166 off 45.1 overs. In reply, Molesworth chased down the total with just two wickets in hand, finishing 8/168 off 36.5 overs. Captain Jamie Adams led from the front with a match-winning 80 runs. Adams hit seven fours and three sixes in a real captain's knock. Daniel Coppleman was next with 20 (two fours) and keeper Brad Ransley 18 (one four, one six). 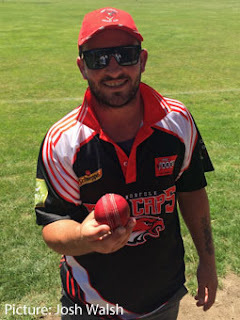 With the ball for Molesworth, Brayden Hodge 3-24 (5.1) and Josh Ransley 2-12 (7) were the best of the bowlers. Gretna I went down to Wellington by four wickets at East Street. Winning the toss and batting, Gretna was bowled out for just 91 off 31.2 overs. Keeper Glenn Blackwell top-scored with 25 (two fours). Aaron Maddox made 15 (two fours) and Mathew Burns 13 (two fours). In reply the home side finished 6/94 off 25.4 overs. Opener Corey Ransley bowled extremely well, finishing with 4-18 off his 10 overs while spinner Craig Cunningham took 2-8 off three overs. Congratulation to Craig Cunningham who played his 200th Club game for Gretna. In Round 7 before Christmas, Jon Smith played his 150th game for Gretna I and Rhys Browning played his 100th game for Gretna I. Well done fellas. Playing one short, Molesworth II went down to Marquis Tigers by 25 runs at Ogilvie High School. The home side had first hit, making 10/177 off 48 overs. Opener Tim Nichols sent down 10 overs and finished with very good figures of 2-14. Nathan Triffitt took 2-22 off four overs and Jake Sorrenson got 1-23 (9). In reply Molesworth were bowled out for 152 off 45 overs. Josh Nichols top-scored with 36 and kept the running to a minimum, hitting eight well-struck boundaries. Opener Tim Nichols made 35 with five fours while Liam Triffitt remained 30no (four fours). Captain Jason Mallinson made 20 (three fours). Scores and stats of the Bothwell v Old Beach were unavailable at the time of reporting.